Ali Holzman may he a new name on the Wisconsin political scene, but she is not a newcomer to public service. Holzman worked as an aide in the Minnesota State Senate to two senators from west-central Minnesota--Gary Kubly and Lyle Koenen, both of the Minnesota Democratic-Farmer-Labor party. 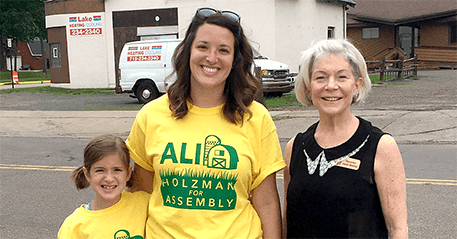 A Democrat running for the Wisconsin Assembly, Holzman said she learned a lot about legislating from Kubly and Koenen. "I’ve seen the difference between a public servant and a politician," said Holzman, a rural Cumberland resident. She gave the example of Koenen continuing to drive a milk truck and school bus in his home district while serving in Senate. Currently Holzman works on behalf of another class of public servants--teachers. She works in the Rice Lake office of the Wisconsin Educators Association Council teachers union. More investment in public education is central to Holzman's campaign. She is especially concerned about the growth of the state’s private school voucher program, which has expanded from Milwaukee to the rest of the state, including St Joseph's School in Rice Lake. "We've had a K-12 public education system that has served us well, but for the past however many years they’re creating a separate system with these vouchers. That will have a devastating impact on our kids and our communities,” said Holzman. Holzman said her views on education and other issues are influenced by people she’s met and her own struggles. "I have pretty strong personal political beliefs, and they’re mostly based in my life experiences," said Holzman. Holzman, 31, said that despite graduating from college in 3.5 years and getting a job in her field, she still has student loan debt. Raising a child, Olivia, has also added to her financial burden. But Holzman said she knows many others in the area have tougher challenges. “When I think about people who didn't have the same opportunities and don't have a job with a decent wage and benefits, I can't imagine how hard it is for them,” she said. Holzman said she quickly realized the level of local poverty after moving to Cumberland with her boyfriend Scott 2 years ago. "I was pretty shocked to see the low pay and no benefits for a lot of jobs," she said. But Holzman was also aware of the shortage of workers in the area. She said those problems could be addressed by focusing on expanding broadband access, maintaining infrastructure, finding ways to increase wages and addressing educational issues. "Having fully funded public schools in all our rural communities that offer every child an outstanding education and new opportunities is an absolute draw for young families,” said Holzman. Holzman said she favors investing in educating people rather than in companies like Foxconn. The Legislature, including 75th District incumbent Republican Romaine Quinn, voted to give the Taiwan-based electronics manufacturer a $3 billion incentive to build a facility near Racine. Holzman said it was such decisions that prompted her to challenge for a spot in the Assembly. “I realized that I should step up. I feel like I have life experiences that a lot of people around here have had, and that some of those voices aren’t being heard and aren’t being represented the best. I felt that maybe I should put myself out there and give people another option,” she said.